If you don't usually buy books to give as gifts, I hope that this year is the year you start a new tradition. For birthdays and holidays, my children always receive at least a one gift bag full of books. If you are looking for new titles to buy and share with your children, you'll find lots of recommendations here on MommyMaestra. Today, I'm happy to participate in a book blog tour and introduce you to a new author and her first published children's book. You may already follow Dania on her blog, La Familia Cool. Dania is not only a bilingual blogger, but also an incredible translator. I've worked with her on other projects before and she is top notch. Her first book for children is another example of her commitment to helping Latino families prosper. 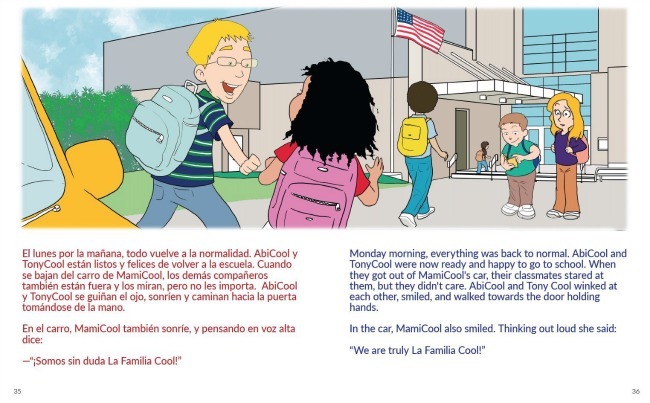 La Familia Cool: El tesoro mas valioso/The Most Valuable Treasure is a sweet story to which many children may relate: Abi Cool and her cousin Tony Cool are feeling bad about themselves because their school mates have made comments questioning their identity. They wonder why it is they don't look like other members in their own family...until Mami Cool shows them a family treasure and changes their perspective. Having married a non-Latino, my own children have experienced looking completely different from the blond-haired, blue-eyed father and their cousins back in Texas. Fortunately, they are proud of their heritage and unique appearance. But only because I've worked hard to foster their interest and pride in our ancestors and their culture. Like our family, the Familia Cool is made up of family members who are as diverse as the Latino culture itself. And just like my own family, they learn to appreciate their diversity by learning about the lives of their ancestors. This illustrations are fun well-done. They complement the story line in a such a way so as to enrich the story, keeping it engaging for young readers. The best part is that this book comes with full text in both English and Spanish making it easier for all members of the family to enjoy. Teachers: this book is works well with lessons and unit studies of cultural diversity, heritage, fitting in, bullies, and so much more. 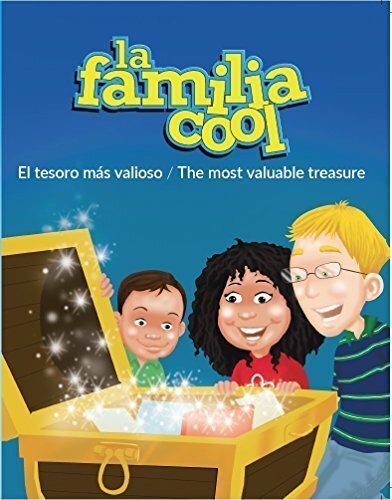 If you are thinking about giving books as gifts this holiday season, don't forget to add La Familia Cool to your list! Thank you so much Monica for your review! I highly value your opinion as an educator, and as a mom raising multicultural children. Our kids need their stories in print not only to see themselves in books, but also to help parents reinforce their teachings about culture and heritage within the context of their particular families. ¡Muchas gracias Mónica! Happy Holidays! Very interesting review. My children are growing in a mix family too and I am very happy there's a new book I could get read to them!